We’re finalists at The Bristol Property Awards! 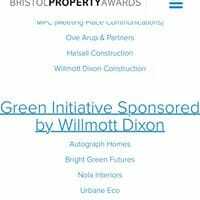 All of us here at Urbane Eco are delighted to be finalists at The Bristol Property Awards on May 17th, 2019 at Ashton Gate Stadium. Congratulations to all the other finalists, and look forward to seeing you on the 17th May! « Our Passive House new build is making excellent progress	» Blog: What is Building Biology?